A blog over two posts, two very different posts under the same title. This first post is long overdue we moved in early June this year about 18 miles from South Oxfordshire to the North. As a purchase it was planned but not believed, we had got as far as waiting to exchange before elsewhere. So when the call came it was a genuine surprise. With 2 days to do it in that was it, but what about Coop & The Gang? I still worked just round the corner so a quiet week to prepare & a move the following weekend wasn’t out of the question. My parents helped us move, Coop & The Gang were out & enjoying themselves while we packed up the van with the first load of badly loaded boxes & bags. That was soon unloaded at the other end & we’d done very well. At this point Doris has knocked an egg from the nest box & doing exactly what chickens do. I’d spotted her from a window & started wailing like a banche…this was the last thing we needed today. Once we had tidied up we sat down & reassesed. Mostly just the garage left & some odd furniture. The bed had already gone. Well wheres the blow up so we can stay here with the girls tonight? It also dawned on us that Coop hadn’t fitted in the car to get here in the first place we’d had to use the van. Our hand was forced. With very little prep, they’d had cider vinegar in the water & fortunately the weather has been very good that week so spirits were high. We’d saved a big box so atleast they could all travel together & they were going with my Dad in his little truck. We took coop apart & bar the felt roof she’d warn quiet well, surprisingly well. We counted the screws out & hoped it would go back together just as well & he’d come apart. I sorted the bedding, the dirty from the not & bagged it up for reuse…maybe incorrectly but at least it would smell familiar. 25 minutes on the road & we’d all arrived, the girls had travelled well & seemed quite contented in a box in the truck. We only had to botch 1 screw & added a few more for security in the deteriorating felt roof. We cleared a space & I made it as homely as I could, used bedding, cider vinegar drinking, some corn mixed in the feed & then we added the girls. They were very happy, despite our garden having no grass. Its all decking, slabs, pebbled beds & slate. Originally we’d ruled this house out because of no grass for the girls but one our 2nd look it was still on the market so we had a look & I stood in the garden & said I had to have this house. 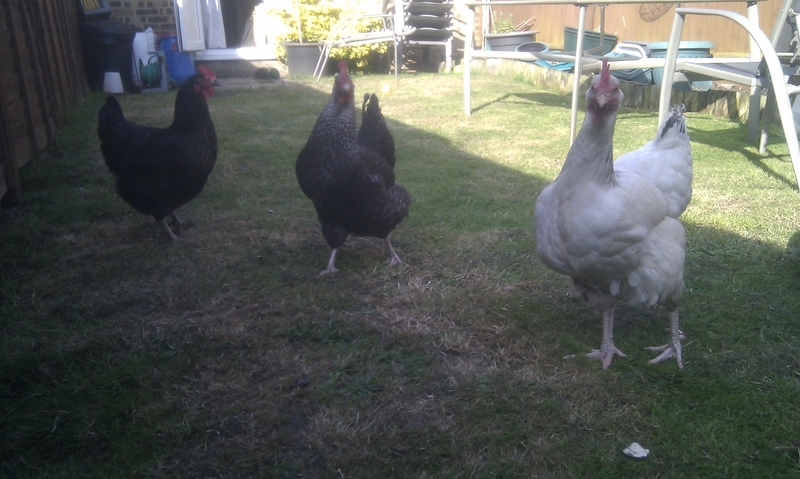 The girls have never been happier, the sound of chickens running over decking is my favourite. They spend many an hour digging in the pebbles & the beds, chasing the new interesting flying bugs our new plants & trees bring. I’ve even caught Mave sat on the edge of the pond to pass the time or maybe admiring the fishes? We have a garage with side access & an out door tap. No more chicken supplies in the living room! We spoke to our immediate neighbours telling them of the girls & if they had any problems with the noise we would make alternative arrangements for them. Someone else within ear shot also has chickens, sitting inside I’ve gone out a few times to see what all the fuss is about to find my girls are just snuffling in a raised bed & the hollering is the other chickens. 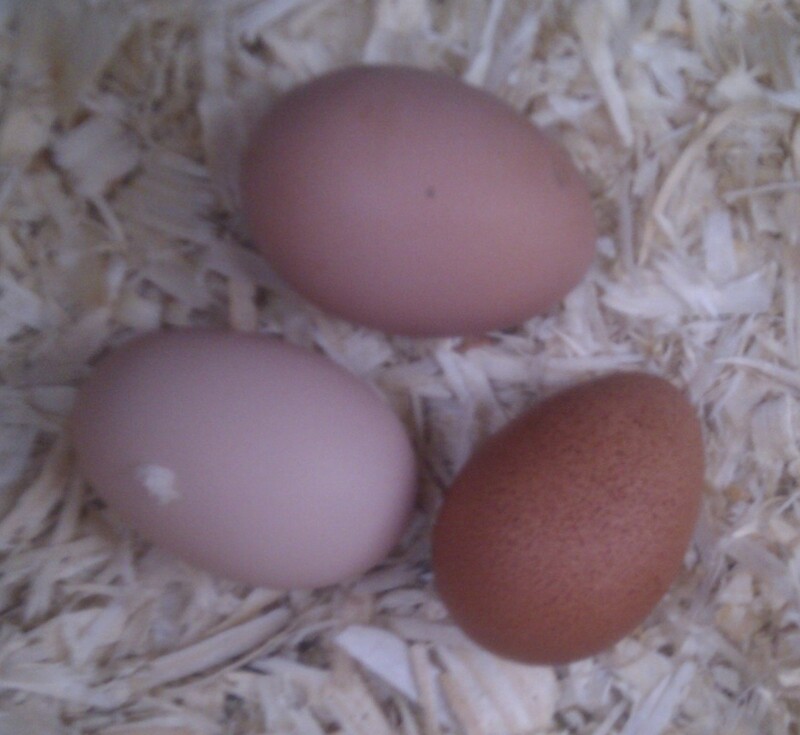 Its lovely, our yolks are so vibrant & they’ve never been so consistent in lay. Happy, Happy, Happy & coop! It’s been a while, in this time I have spent a lot of time at home relatively speaking given the confines of a 9-5 job Monday to Friday and this has meant some real time with the girls. While this has mostly resulted in a lot of wet play with dirty foot prints up the back step but we have celebrated their first birthday with us with some hot worms and snuggles on the back step, seeing them peck at the bowl, select the one they want, bash it on the ground and subsequently run as quickly as they can around the garden with the other two in toe. The chance to spend time with them has made me rethink the dynamics of the group. Initially we thought Mave was in charge, her stout stature, constant squeaking and bravery to take the lead, enjoy the human contact and know what to do to get what she wanted made her the clear leader in the pack. Doris fell second in line, keeping out of the way and moving in her own way and Flo took all the flack from Mave, comb and wattle pulling, being bumped out of the way and just getting doused in anti peck and choosing to spend her mornings with me rather than with her own kind. When Mave fell sick with lice, which took us longer to rid of than we wished, the dynamic changed. It was nice, everything just seemed to work, everyone was eating, drinking and having fun. I’d even go as far to say everyone was sharing. forget that you’re there it appears the dynamic may never have been what I thought. There were always odd moments when we thought Doris seemed to be in charge, if the gang is at risk she’s at the helm, sounding the alarm and putting herself between the girls and danger. Originally we put this down to the size differential, for a Light Sussex she’s built like a house. If things got desperate she’s the one you’d eat. But yesterday I was sat in coop during laying hour, I don’t know why it was hot and it was shady and cool in there. But as I was topping up the bar with cool drinks and hanging some cool treats for the girls to play with later something rather odd happened. Mave was doing her post lay squat for a while, Doris wandered in, decided she wanted Maves spot and just got herself in the same nest box and used her head to get under Mave and send her on her way and Mave just let it be. My Mave, Mave the merciless, Mave who doesn’t take nothing from no body, yeah that Mave. Is Mave vying with Flo for second place? Has Doris always been in charge and this always the battle for second place? Changes are a foot either with them or how I see my girls. It’s still technically winter, but there is something in the air that tells us spring is on the way, the clocks are not long due to change, the evenings and mornings are getting ligther and the garden is trying to look more spring like every time we open the curtains. 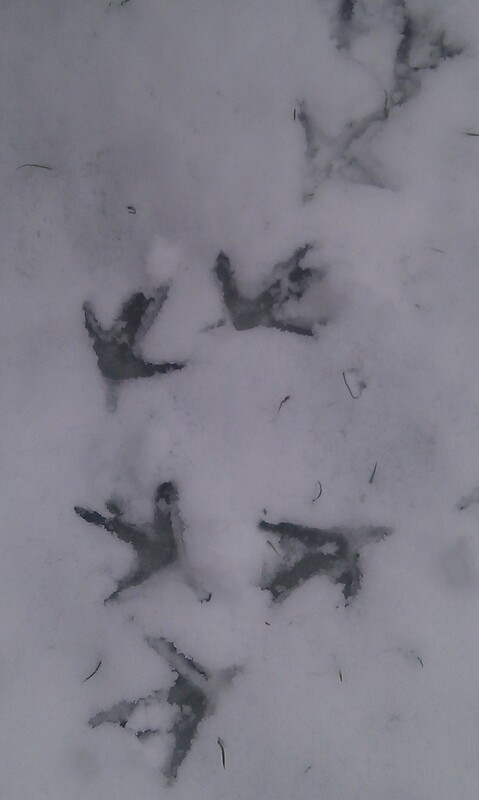 The chickens are most definitely warming up for spring; the increase in day light has made a big difference. Mave is back baby. After a long hiatus from laying since October in fact, getting over lice and an early and prolonged moult she’s back. Her comb had shrunk and become dull but she was fine spirits, bar the indignities of my insistent inspections but her comb is back to its full shape, her ears, wattle and comb are back to a beautiful vibrant red and all the girls have come back into themselves. Although we’ve not kept chickens for very long and I still fail not to get excited with every egg in the nest boxes, Wednesday was a particular thrill, three eggs! All different in size, shape and colour. Maves so tiny but perfectly formed but such exciting times…a full nest box! A palatable hopefulness for the future in the air and a positive reinforcement for me that all my girls are happy and hearty. Even with this thick fog that starts the day there are tiny signs all around that spring really is on its way. 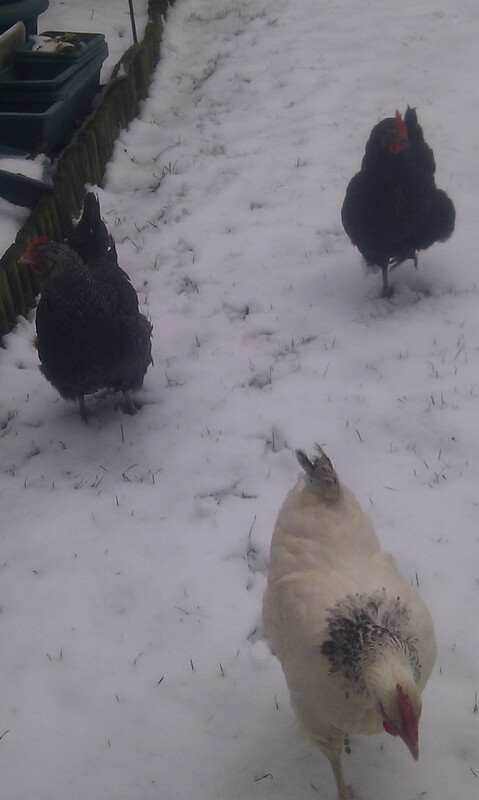 Well our girls wouldn’t have even been a glint in the eye the last time we saw settled snow. They didn’t see at all put off ealier in the month as the snow fell, but I suspect that was because they thought it was a shower of corn. 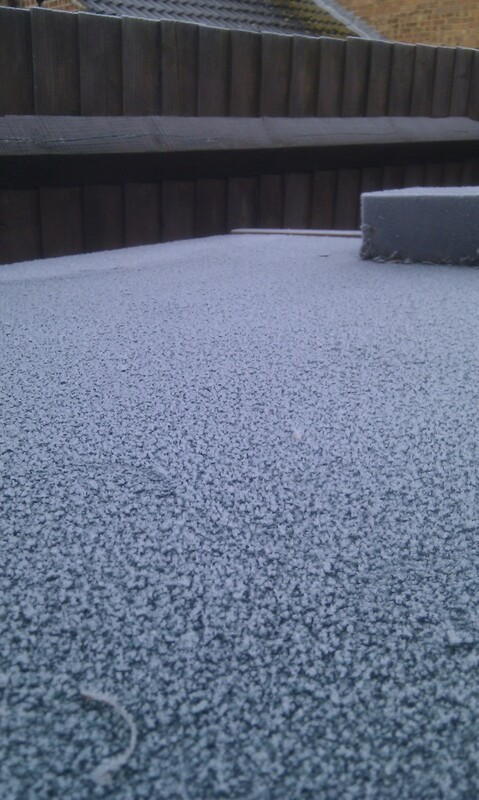 This mornings response to the snow came as no great surprise, all very non plussed. Doris stepped on it, around it & tried to eat it. Florence was the first to brave some eager steps, albeit the already melted ones. 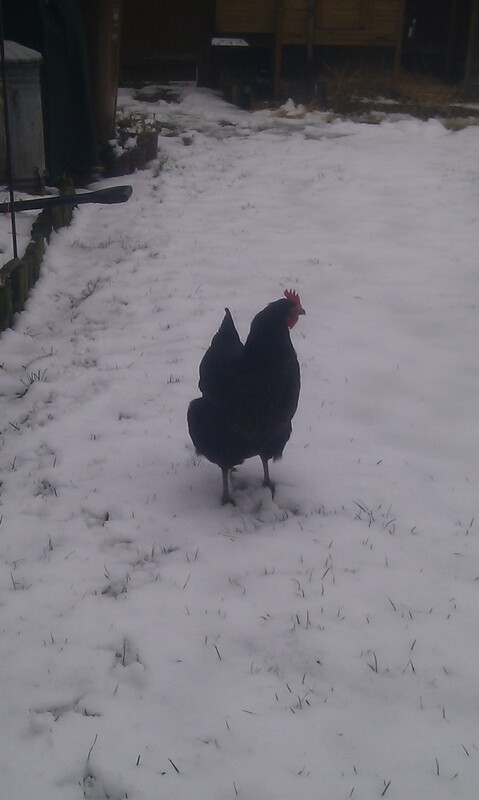 It was Mave who bravely led the group out to the clearing & through the snow to the top of the garden. Well it appears winter has arrived, with the signs of a hard frost not cleared by the dusk of the day drawing in and the first frozen drinker of the year. This morning was a bit of a palaver, everyone keen and eager to rise and then one feel of the bitter chill in the air the girls were less than impressed. On discovery of the frozen water trough I headed up the garden to get the replacement bought earlier in the year in anticipation. At which point the girls duly squawked and followed, with tiny little quick footsteps as if to say I don’t like this but I know you’ve got corn so gimmie. They endured for as long as they could and it was straight back to Coop, they all snuggled up in the far corner which is sealed on both sides, at which point they had fresh food and water so I retired back to bed to warm my hands and toes. As I suffer with Raynauds which is likened to being allergic to the cold more specifically a change in temperature I am very aware of how miserable it is to be cold. 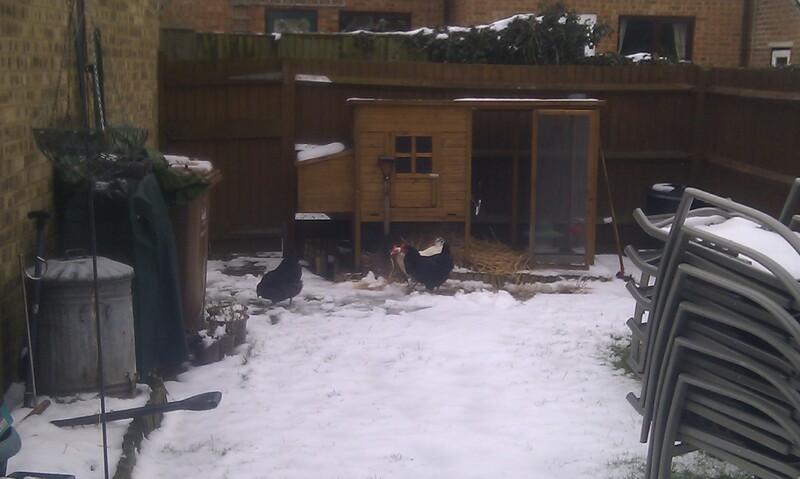 Are the Chickens likely to be cold? There is a little part of me that thinks the answer is yes but in reality you don’t need to worry about your hens being cold, they’ll be fine! When I looked at preparation for the winter months earlier in the year, I looked at the possibility of a day light bulb to increase egg production but decided against it on the basis of a more natural approach but I also looked at heat pads to underneath the drinkers, the big problem I found is that those available on the market are round and our drinker is a oblong trough. They’re relatively simple and ensure chickens have fresh running water at all times; it may be a vital move if the weather continues to descend. Coop has been inspected for drafts and the ventilation option changed over to winter at the rear of coop, as the sun came up the girls warmed up and came out to play, dust bathing and playing with their treat dispensing ball filled with meal worms and corn for some essential before bed fat. We are lucky have chosen hardy and sturdy birds more by luck than judgement and our only immediate cold weather defence is Vaseline. Any bird with a large wattle or comb could benefit with an application to help prevent frostbite on exposed and sensitive areas, a little hat and gloves if you please. Some chicken breeds will require more attention in the cold some of the more ornate breeds… anything with some exposed flesh or light feather. So glad I didn’t acquire the three frizzles on sale at the last Open Farm Sunday at my friend’s farm they would need a heat pad and a blanket. Although that said, our hen house is quite large and my birds are but three, seems like a rather good excuse to acquire one or two more. Or perhaps just a heat lamp! The last few days the girls have been giving us grief or maybe my tolerance levels are running a little low but the incessant unrelenting tapping on the back door has seen me shuffling them straight back to coop with a flea in their ear. I can’t work out if they think the paint spatters on the back step are corn they can eat or that I’ve taught them too many bad habits by always feeding them while I sit on the back door step and fussing them when they started tapping. We live in an end terrace, built up small estate. We have screaming babies, small yelling children, irritating yappy dogs, catawalling cats and cars wheel spinning in and out of the road to visit three doors down at all hours. In spite of all this in the quiet times, our estate is quiet. Till recently. Hens for the most part don’t make a lot of noise, they’ll alert each other to danger, squawk to reintegrate themselves into the group and announce they have laid an egg, but there is no unrelenting alarm call that comes with a cockerel. Mave has always been a talker, well a squeaker and likes to interact with you on a you cluck I’ll cluck basis that proper soothing cluck cluck sound that really does warm your heart. Florence is always a barometer for danger, an odd cluck when she’s really had enough of being under your arm to a full on b’caw ‘b’caw when she spies the neighbours cat or a red kite apart from this you wouldn’t know Florence was around…the amount of times we’ve tripped over her as we didn’t even realise she was there. Doris, well she was quite. Recently she has somewhat fallen in love with the sound of her own voice, not the soothing cluck cluck…the kind of chicken-a-walling that means at 7am, I can hear her through our closed double glazing. She is the only hen on top form presently, Mave is still covered in pin feathers and Flo has only two remaining tail feathers for her efforts with the moult. down the front of Coop belting out her morning tune one b’caw after another, I hoped she’d wear herself out with all the yammering but no the only thing that settles her is seeing someone she knows outside. Which sadly at the moment is my only option, while I would rather she didn’t realise she could summon me on a Saturday and Sunday to her our neighbours ALWAYS sleep with their window open & they’re good people who deserve a lie in. Really I do just want her to be quiet. With Doris is doesn’t seem to matter if she’s cooped up or free range, if she wants to wail like banshee she will at the moment. Fortunately it doesn’t appear to be earlier than the permitted noise hour of 7am but still not everyone wants to be up at that hour. While tidying the garden and giving Coop and good deep clean out and while the girls were stuffing their faces on worms and slugs uncovered by the clean up we had Doris up on the table for a good look over, she’s not in pain, her skin and feathers are good, nice clean eyes, strong beak, good colouring, so why the hollering bird? I do worry about the noise from Coop & The Gang, it’s not a “normal” noise you’d put on your urban environment list of most people so it stands out and we benefit from the laughs & the eggs and even I find it annoying sometimes! 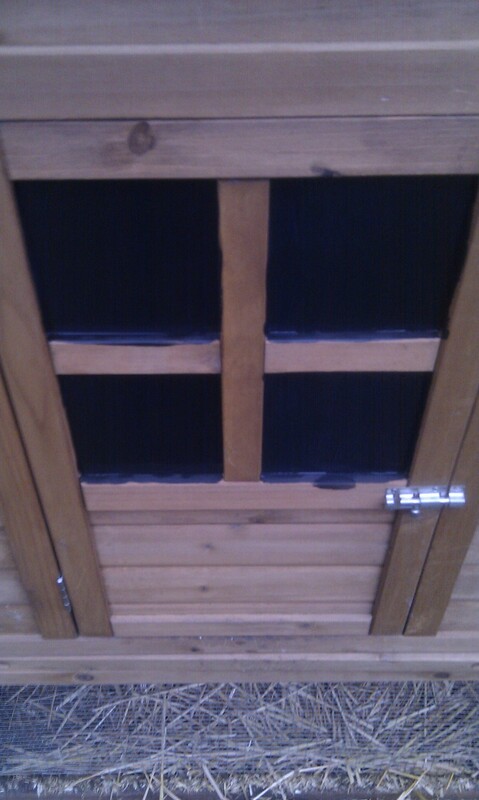 This week we have permanently black out the windows in the hen house with blackboard paint, precision not required and I am considering lining the door once we’ve done this to act as a little insulation noise and otherwise. Any other suggestions? We’ll Coop & The Gang don’t half talk about Mave…We are a family of three after all. The only thing Mave isn’t contributing to at the moment is egg production, that’s Doris & Flos domain. 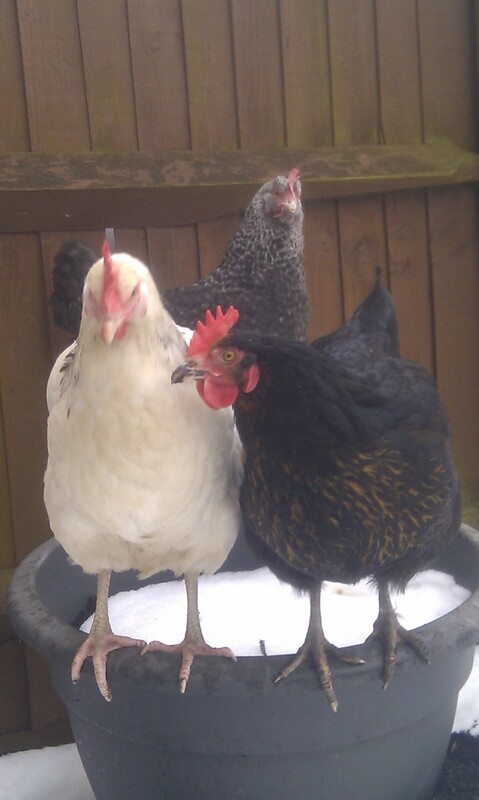 Despite my belief that although our girls claim to be pure breeds, I suspect they are a motley crew. I’ve inspected enough chickens up and down the land in the last 8 months so know there are some noticable differences in our girls to the “true” breeds I’ve seen. They provided 12 perfect eggs between them for Christmas morning scrambled eggs and smoked salmon, there would have been more had I looked a little harder. We have a hider in our midsts. My money is on Doris, who on the night time inspection is always found resting in the nest box. She kicks all the bedding out the way and snuggles down, she’s more than happy for you to have a stroke and feel under her for the odd egg or two but left over night on them you’ll find them gone the next day. It wasn’t till we were home late one mild night and decided to leave the girls out for the night, we are relatively predator free & lord knows the girls would give as good as they get wake me up and I am more than capable of throwing things out of the window with relative accuracy that would see most things smaller than a wild boar out of the way. I left collecting eggs that day till the light was fading, she liked the fuss but there was nothing, she decided to take her space on the perch and with a whip of her wing she dislodged some shavings on her exist, what’s that…that looks egg coloured. Once she’d departed I started to move the shavings out of the way, I rootled in all the corners and one egg, two eggs, three eggs, four. Two a piece for Florence and D Unit. Florence is a stealth layer, you rarely notice she’s gone to lay an egg, as soon as she’s hears some fun somewhere else she’s off and her laying and egg song isn’t the most dominant in the group. I also don’t think she spends enough time in the next box to be the hider. I’ve considered if Doris is broody. Out of all the girls I suspect she is the truest to her breed and with that comes a higher change of becoming broody, a modern hybrid is less likely to have this desire…apparently. But despite her egg song being both loud and proud, I’m not convinced. She does tend to sit on a number of eggs at the end of the day and chickens typically won’t start to incubate until a whole clutch is laid. She seems in fine feather between legs and breast and she’s not growling at me when I pet her on the box and once they eggs are gone she will happily leave the nest box and roost on the perch. We have had one broody poo, a lovely flat glob of poo in the nest box that smelt so bad but for every egg removed she’s placing another one but she’s not nest building as such, we’ve had no added leaves, twigs of straw bought up, just most of the bedding kicked to the sides and used to hide eggs. My next thought was predators and although chickens aren’t credited with being very smart they are always smarter than people give them credit for, we get taps on the back door when they want feeding, fuss or both and they even sit on the windowsills watching what we’re doing. We’ve never had an incident of any of the gang showing an interest in eating eggs, even when we had the two soft shells earlier in the year, I was more worried about getting them out of the way before they did. We’ve seen no signs of broken eggs so I can’t see that she’s hiding them from her fellow coop mate. 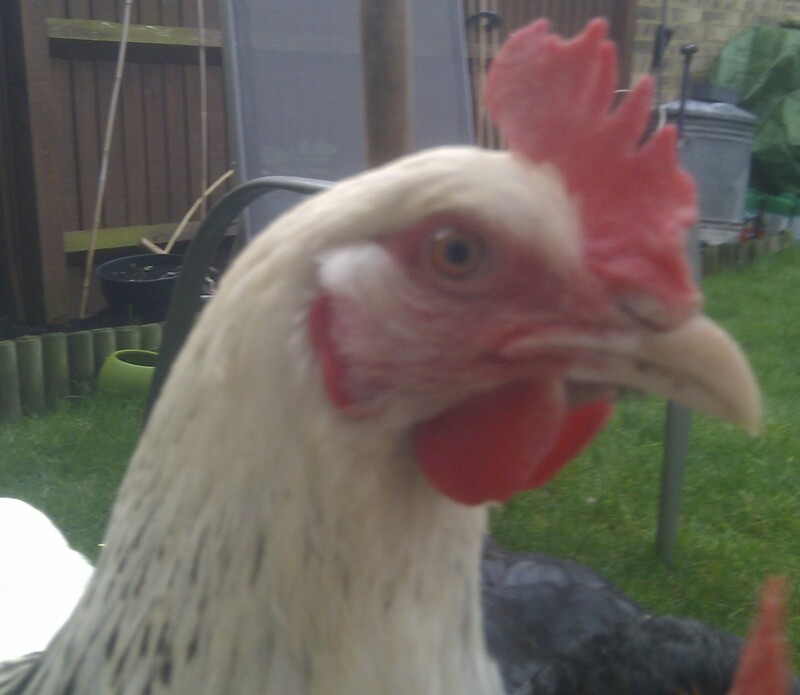 Maybe Doris is just being funny, maybe she is thinking about getting broody but doesn’t really know whats going on. We’ll keep an eye out and see how she goes. The mothership kindly picked up Coop & The Gang a rubber egg for Christmas should we need to formulate an intervention!